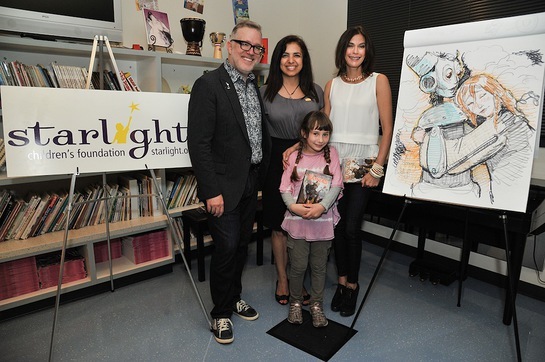 Earlier this week, Starlight Children's Foundation Global Ambassador and New York Times best-selling author Tony DiTerlizzi (“The Spiderwick Chronicles,” “The Spider and the Fly,” “Ted”) and Starlight and Juvenile Arthritis Association (JAA) supporter and actress Teri Hatcher (“Coraline,” “Desperate Housewives”) entertained pediatric patients in treatment for juvenile rheumatoid arthritis at Children's Hospital Los Angeles (CHLA). The pair entertained patients with a reading and illustrations from “The Search for WondLa,” the first installment in DiTerlizzi’s middle grade science fiction fantasy WondLA book triology. Hatcher, who voiced all three audiobooks in the series, read selections from the book while DiTerlizzi brought the scenes to life through sketches. The children sketched along with the author who provided sketch tablets for each child who attended. DiTerlizzi is currently on a national book to promote “The Battle for WondLa,” the trilogy’s third book. Publisher Simon & Schuster generously donated copies of “The WondLa,” the trilogy’s first book, to Starlight who provided copies to all of the patients at the event. The book will also be offered to the more than 400 partner facilities currently on the charity’s Starlight Wish List platform, an innovative online giving and product philanthropy marketplace that directly connects individual donors and charitable corporations to health care facilities around the U.S.
For more than five years, Caldecott Honor winner DiTerlizzi has lent his creative talents and literary esteem to Starlight by raising funds and awareness for the organization. 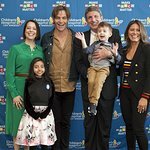 Hatcher is also a longtime supporter of Starlight having attended many events for the charity, including its annual fundraising dinner gala in Los Angeles, the Starlight Awards.